It was May 2009 when the well-loved pair of infernal investigators, Jago & Litefoot graced our hears and speakers with a Companion Chronicles release, The Mahogany Murderers. That title proved to be a pilot, so successful was it that a year later it was announced that the pair would be getting their own spin-off range. Since then, the dynamic duo has faced down villainous doctors, werewolves, the Scorchies, The Master and a whole other plethora of paranormal paraphernalia. Jago & Litefoot even saw the return of Leela and the Sixth Doctor, they travelled to Venus and back to the lost colony of Roanoke before being accidentally stranded in the sixties. And then Strax turned up on their doorstep, followed by an adventure with the Tenth and Eleventh Doctors. Jago & Litefoot have been around the block, we’ve all enjoyed their adventures. But every adventure must come to an end. Following the tragic passing of Trevor Baxter last year, the future of the Jago and Litefoot range was up in the air. There were still a couple of Short Trips’ releases and a further series to enjoy but what about after that? Future series’ had already been planned but not recorded. How would the range be brought to a satisfying close? That question fell to Paul Morris to answer. Luckily he was up to the challenge and Jago & Litefoot Forever proves to be a very satisfying conclusion to one of Big Finish’s best series. 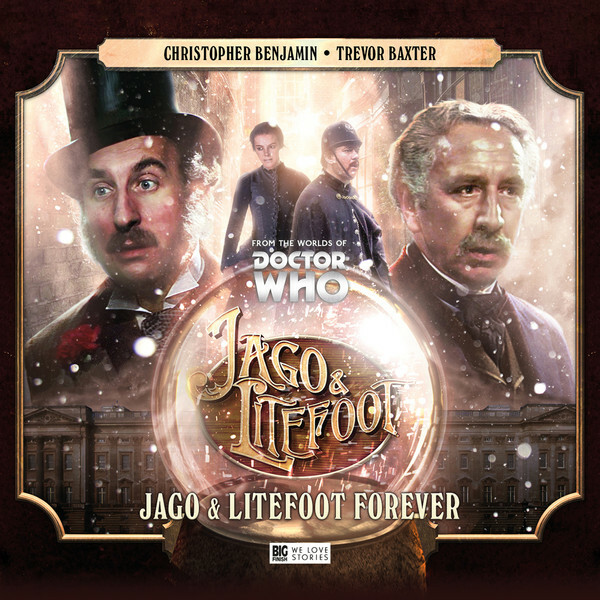 What Jago & Litefoot Forever proves to be is a memorial release and as such there are several flashbacks and memory flashes to give Trevor Baxter a time to shine. But these sequences are more than just an excuse to put Trevor Baxter in the show as Morris turns them into vital parts of the overall plot. Jago is reminded by Betterman that, with his faltering mind, the best way to hang on, is to remember the best moments of his life. These moments are of course those shared with Litefoot and so he takes centre stage in the shining recollections of his dearest friend. What was also glorious was that the story takes the gang back to the Museum of Curiosity and they all get to have a trip down memory lane with little snippets from other stories coming and going. It all serves as a reminder to us listener how close this gang have become over their years of investigations and intrigue. With Series 13 having ended on a cliff-hanger which Forever addresses and ties itself into proving to be a resolution to that story. Of course, a one-hour runtime isn’t enough to delve into it properly but it does a brilliant enough job anyway. Morris mines his script for every possible emotional moment and Christopher Benjamin is just superb as he instils a feeling of humility to the bombast and pride usually associated with Jago. As well as Christopher Benjamin and Trevor Baxter taking one last bow, the entire cast of Jago & Litefoot come out for their curtain call. Lisa Bowerman, long associated with Bernice Summerfield has found another character to shine in, in the form of barmaid Ellie Higson. Conrad Asquith has been excellent as Inspector Quick and David Warner is always a welcome presence in anything in his in. Take a bow all you beautiful people. The final scenes are where the tears and heartstrings will be tugged at. Arriving at Buckingham Palace to receive knighthoods for their heroics in the recent years, Jago and Litefoot are expecting a small celebration with their close friends, Ellie, Quick and Betterman. Little do they know that some other familiar faces have come too. Louise Jameson pops up as Leela and Colin Baker makes an appearance as the Sixth Doctor. These moments are beautifully written. Jago wonders if the Tenth and Eleventh Doctors are there too, while Litefoot ponders on whether the Master is going to make an appearance. Jago & Litefoot Forever might not have been the finale for the series that Big Finish had envisioned as it felt like a series that would thrive forever. And despite the fact that he is now travelling the universe in the big TARDIS in the sky, Trevor Baxter’s presence oozes over this story, almost like his shadow is always there, smiling down on anyone who listens. Well done everyone, Trevor would be so proud. Tonight’s lecture to the Club For Curious Scientific Men will be given by Professor George Litefoot, pathologist – assisted by his esteemed colleague Mr Henry Gordon Jago, theatrical impresario – who will recount a sequence of outlandish events in London and Greece, ruminate upon the nature of good fortune (or rather its absence), and provide a surprising account of a mercurial old friend. The lecture starts at 7:30 and will include an interval. Jordan has loved Doctor Who for as long as he can remember and television in general. Many people blame his old teacher for what they believe his is obsession, he doesn't care though, his head is off in time and space most of the time.